No MacBook user would be able to make the most of their computer without considering security, against both outside intrusion from the Internet and prying eyes. It’s important to take precautions to protect your privacy. Although diminutive, the padlock icon that appears at the left side of the Address box when you’re connected to a secure website means a great deal! A secure site encrypts the information that you send and receive, making it much harder for those of unscrupulous ideals to obtain private data, such as credit card numbers and personal information. You can click the padlock icon (next to the site name) to display the security certificate in use on that particular site. A secure website address begins with the protocol prefix https: instead of http:. First, here’s a definition of this ridiculous term: A cookie, a small file that a website automatically saves on your hard drive, contains information that the site can use on your future visits. For example, a site might save a cookie to preserve your site preferences for the next time or — in the with sites such as Amazon.com — to identify you automatically and help customize the offerings that you see. In and of themselves, cookies aren’t bad things. Unlike a virus, a cookie file isn’t going to replicate itself or wreak havoc on your system, and only the original site can read the cookie that it creates. However, many folks don’t appreciate acting as a gracious host for a slew of little snippets of personal information. Click the Privacy toolbar button. From Third Parties and Advertisers: This option allows sites such as Amazon.com to work correctly without allowing a barrage of superfluous cookies. To view the cookies currently on your system, click the Details button. If a site’s cookies are blocked, you might have to take care of things manually, such as by providing a password that used to be read automatically from the cookie. Feeling nervous about the data stored by the websites you visit? You can delete all that stored information with a single click. 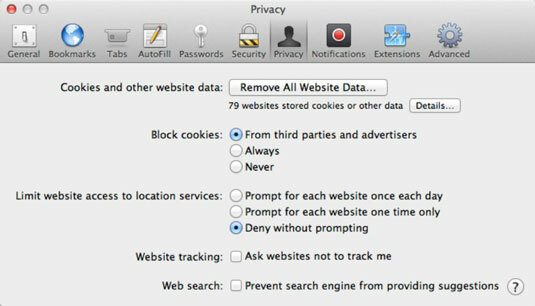 From the Privacy pane in the Safari Preferences window, click the Remove All website Data button. You’ll be asked to confirm your draconian decision. The Privacy pane also includes the Ask websites Not to Track Me check box, which works sometimes. Unfortunately, each website decides whether to honor Safari’s request for privacy. (Some sites use tracking legitimately, to keep track of your likes and purchases each time you return.) If you’re especially worried about leaving a trail of breadcrumbs behind you on the web, however, you should select this check box. Luckily, Safari makes it easy to dump the contents of your cache file. Just close all tabs and open windows, choose Safari→Empty Cache, and then click Empty to confirm that you want to clean up your cache. As you might imagine, your History file leaves a very clear set of footprints indicating where you’ve been on the web. To delete the contents of the History menu, close all open Safari tabs and windows, and then choose History→Clear History (at the very bottom of the History menu). Safari also allows you to specify an amount of time to retain entries in your History file. Open the Safari Preferences dialog, click the General tab, and then click the Remove History Items pop-up menu and specify the desired amount of time. Items can be rolled off daily, weekly, biweekly, monthly, or yearly. From time to time, you might run across a website that actually does something constructive with pop-up windows, such as present a download or login prompt. If you need to temporarily deactivate pop-up blocking, press cmd+Shift+K to toggle it off. Then press cmd+Shift+K again to turn pop-up blocking back on after you’ve finished with the site.